Big cities are notoriously expensive, but in this article in our series from guest bloggers about their corner of Spain, Simon Harris gives us insider knowledge about the best ways to see Barcelona on a budget. One of the great things about Barcelona is that, until quite recently, Ciutat Vella – The Old Town – and The Ramblas used to be very rundown so finding dirt cheap accommodation was really easy. Even though the city’s gone up in the world in the last decade, there are still quite a few honky-tonk pensions generally frequented by cockroaches and ladies of the night, but let’s face it it’s probably worth paying a few euros more for somewhere with at least one or two stars. There are many Cheap Barcelona Ramblas Hotels to choose from but, if you ask me to stick my neck out, I’d go for the magnificent Hotel Lloret at La Rambla 125 near Plaça Catalunya or Hotel Fornos further down at La Rambla 44 right next to Plaça Reial. Hotel Lloret is a one star Barcelona hotel that’s seen better days. The building dates from 1926 and the idea of having breakfast in the pre-Civil War dining room or looking out onto the legendary Rambla de Canaletes is my idea of heaven. Hotel Fornos used to be one of those honky-tonk hostels that I mentioned earlier but was refurbished a few years ago and now proudly brandishes two stars. Immediately facing Carrer Nou de la Rambla and Gaudí’s amazing Palau Güell and on the corner of regal Plaça Reial with its bars, clubs and lampposts by Gaudí, this really is a magnificent location. The prices at both hotels vary depending on the time of the year but a double should cost around 60 euro, and the truth is these aren’t the only options. There are many more Cheap Barcelona Ramblas Hotels to choose from. I don’t know about you but I’m a big believer in having a decent hotel breakfast when I’m on holiday – it gives me strength to do all the necessary hiking about that seeing a new city involves. Something to bear in mind about Barcelona Food and Drink is that once you’re out and about, you should avoid the temptation to stop for a beer or something to eat at one of café terraces along The Ramblas itself – you’ll be seriously stung for the privilege of sitting out on Barcelona’s most famous street. A quick stop at the beautiful Café de l’Opera is almost obligatory, but I’d go inside if I were you. You’ll get a much better sense of the history of the place and also get charged half the price. For a quick drink and a sandwich, you’re best off venturing into El Raval, which is on your right as you walk down The Ramblas from Plaça Catalunya. 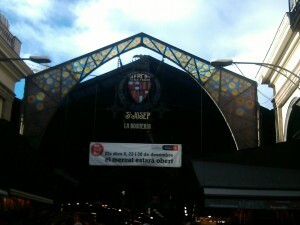 You’ll find plenty of cheap bars here and I’d recommend the top section above Plaça Reial and Carrer Nou de la Rambla. As lunchtime approaches, keep an eye out for chalkboards announcing the Menu del Dia – a three-course meal including wine that shouldn’t set you back much more than 10 Euros. If you want to mix eating, drinking and foodie sightseeing, I can highly recommend both Bar Boqueria and Bar Central – paradas 282 and 494 inside the famous Boqueria market. At both places you eat really excellent quality food for under 20 euros – now that’s real insider knowledge for you! Federico García Lorca described The Ramblas as the street he wished would never end and you can spend at least a couple of days without venturing far from it. However, once you do I strongly recommend you buy a Barcelona Card, which covers from 2 to 5 days depending on the length of your stay and will entitle you to unlimited public transport. This includes buses, metro, local trains, ferrocarrils and Barcelona trams. However what’s really great about it is it gives you free entry and discounts at Barcelona’s top museums and monuments, including the Museu Nacional d’Art de Catalunya, the Picasso Museum and the Sagrada Familia. The Barcelona Card also offers bargains in shops and on leisure activities. One of the best freebies is without a doubt the Golondrinas boat trip around the old Port of Barcelona, for example. So with a cheap hotel, reasonably-priced eats and the Barcelona Card,a few days getting the best out of one of Europe’s coolest cities definitely doesn’t have to break the bank. Simon Harris has lived in Barcelona since 1988. He is author of the acclaimed book Going Native in Catalonia (link goes to Amazon Spain Kindle store, for paperback from Amazon UK click picture above). 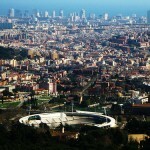 He also helps visitors to Barcelona get the best out of the Great Enchantress through www.barcelonas.com.